Community schools act as a vital lifeline to education for one-fifth of all students in Zambia, yet these schools face many challenges. 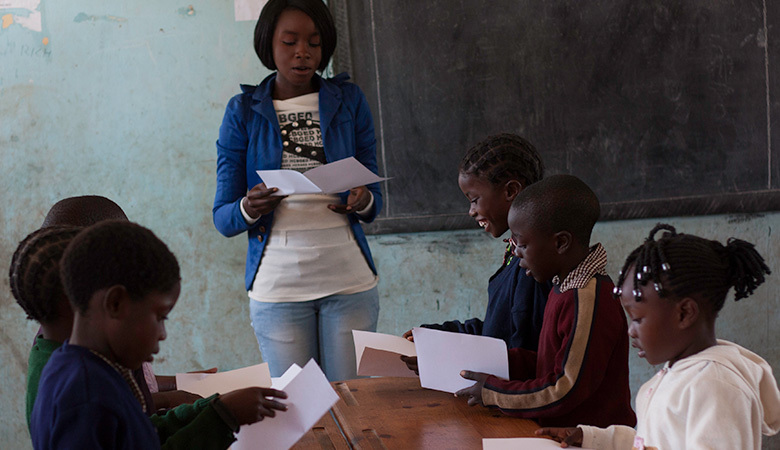 Teachers are often unpaid volunteers, and books and basic classroom resources are limited. Many students have to walk for miles just to get to class. As a result, student achievement at community schools is often lower than at government-run schools. EDC improved services and structure of these community schools through the USAID-funded Time to Learn project. In conjunction with Zambia’s Ministry of Education, Science, Technology and Vocational Training, Time to Learn worked to make education available to young people in Zambia who are living in some of the most challenging circumstances. The project was an essential part of the country’s efforts to meet national education goals as well as the 2015 Education for All and Millennium Development Goals, and its impact lays out next steps to improve community schools and programs for vulnerable children. "Learning from Community Schools in Zambia"
"Going High-Tech in Low-Resource Classrooms"
This report studies the cost-effectiveness of information communication technology (ICT) in community schools during the Time to Learn project. The Vernacular program is a set of reading activities that Zambian primary students can complete using Android tablets. This report summarizes the results of the Time to Learn project in Zambia, which was funded by the U.S. Agency for International Development with additional support from the President's Emergency Plan for AIDS Relief (PEPFAR). The five-year project worked to improve the quality of Zambia's community schools and supported orphans and vulnerable children (OVCs).